Background: Dietary fibre (DF) has been recognised as having many positive health effects. Hence, the objective of this research was to evaluate the consuming habits relating to DF on people from different countries, as well as their knowledge about the fibre rich foods and their attitudes towards food labelling. Methods: A descriptive cross-sectional study was undertaken on a non-probabilistic sample of 6010 participants from 10 countries. Descriptive statistics and inferential tests were done using SPSS software considering a level of significance of 5%. Results: The results suggested that the ingestion of fibre rich foods like fruit, vegetables and cereals, was low and far from the recommended amounts. It was also concluded that most people did not pay the desired level of attention to food labelling and nutritional information. Furthermore, the level of knowledge about dietary fibre was generally not satisfactory. Conclusion: In view of these findings it becomes important to develop actions to better inform the population and to make them better aware of the importance of dietary fibre in their habitual diet. 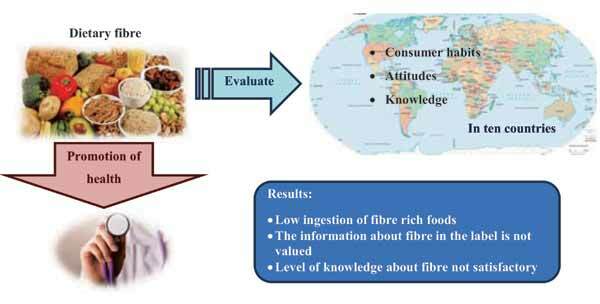 Dietary fibre, consumption habits, labelling, fibre rich foods, sources of fibre, survey. Escola Superior Agrária de Viseu, Quinta da Alagoa, Estrada de Nelas, Ranhados, 3500-606 Viseu, Portugal.